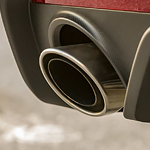 Ford Mustang Now Comes with Customized Exhaust Audio | Karl Flammer Ford Inc. It used to be the case that drivers would have to choose between driving a car that excelled at gas mileage and one that delivered on powerful performance. The new Ford Mustangs are making that choice a thing of the past. Owners of Ford Mustangs with the 2.3-liter EcoBoost engine can now enjoy active performance exhaust audio settings so that they can control the level of sound emitted from their exhaust system. There is also a "good neighbor" setting that lets you set a time range during the day with noise level limits so that your neighbors do not have to hear the smooth, powerful throttle of your exciting Ford Mustang. This is just one of the many ways that Ford is bringing fun and customization to its newer Mustang models. Test drive the incredible new Ford Mustang at Karl Flammer Ford Inc. and Tarpon Springs to see which features you love the most.